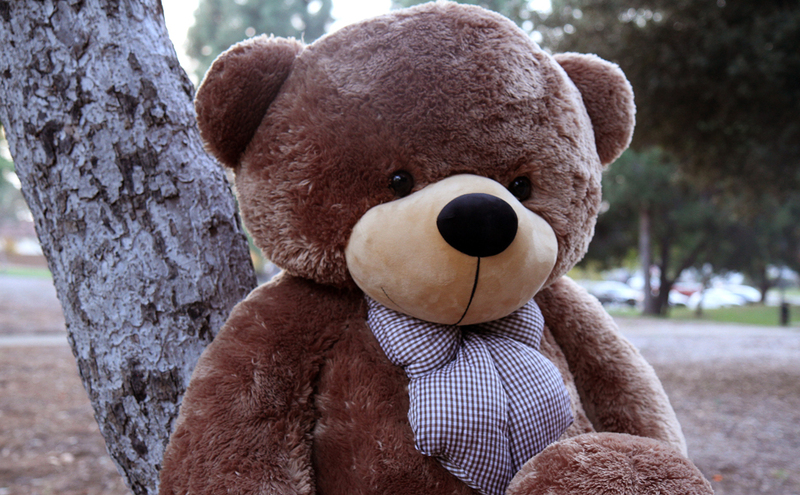 Sending one of our biggest teddy bears is the perfect way to express your love! Give the gift of friendship and tenderness with a Giant Teddy stuffed bear like Sunny Cuddles. Sunny is an extremely soft and huggable 5 foot bear with a heavenly plush mocha brown coat. Its big brown eyes are filled with a lively twinkle, an expression of the love and kindness that extends to Sunny's new home! Its chubby nose is made of smooth velveteen fabric; divinely soothing to the touch. This precious and huge teddy bear measures 60" in height and is also available in larger and smaller sizes in a kaleidoscope of colors. It wears a dashing checkered bow that adds the right touch of whimsy to its design. Being well constructed, durable, made with child safe fabrics and meeting or exceeding all US safety standards guarantees that Sunny Cuddles is perfect for snuggling! A wonderful collectible, as all Giant Teddy jumbo teddy bears are! Great product! 2 yr old nephew loves climbing & playing with. Durable so far. Huge teddy bear! Quality is very good - soft and very well-made. Seems like very high quality work! I would highly recommend this product to others and will definitely buy more from this company. I love this teddy bear so much, he's the softest fluffiest teddy bear ever. 1005 LIKE BUY IT YOU NEED IT IN YOUR LIFE. It is a great teddy bear to cuddle up to. I have purchased quite a few giant bears from Giant Teddy and they have all exceeded my expectations! Sunny Cuddles is a big, super soft, awesome bear that anybody would love to receive! Buy any bear from here and you'll love it. I was extremely pleased with this order. The teddy bear is very nice quality- very soft and plush. Further, I had to alter the destination of the teddy bear after it had already shipped, and the company handled it with no problem - there was just a one day delay and no issues whatsoever. Fabulous customer service! Excellent quality!!!! So soft and huggable! It was a perfect Christmas gift! Valentine’s Day Life Size 5ft Teddy Bear in “I Love You” Boxer Shorts – 6 Fur Color Choices!